two-fist·ed – (‘tü-’fis-təd) Adjective: marked by vigorous often virile energy. As in two-fisted journalism. A man holds a pair of binoculars, one hand wrapped around each side. His fingers are curled like fists, and they come together making a strong symbolic statement. You’re looking at a two-fisted bird watcher, buddy. Birders were once portrayed as ladies in tweed and guys who looked like bookish nerds. But tough men and women are birding and they’re not tweedy or nerdy. They’re Army Rangers on patrol. They stalk wild animals: Spring migrants that were in a South American jungle a month ago. Or winter visitors that crossed the Canadian tundra to get here. Bobcats and bears are cool, and we see a few. But birds come in wild varieties, and spotting them is a physical and mental challenge; a two-fisted sport. You just can’t hold a pair of binoculars up to your eyes without putting up your dukes. The two-fisted bird watcher is here. Maybe, the two-fisted bird watcher is you. Is it an online magazine? A birding site? A blog? 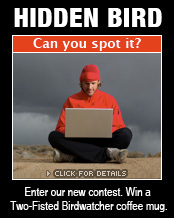 January’s Hidden Bird Contest has a Winner!